Handtrucks2go is proud to be the first website to offer a "Build Your Own Hand Truck Ramp" option where you can actually design your own ramp online, get instant pricing, and purchase it online. The starting price is $599.99 which includes free shipping, extra charges for bigger sizes and upgrades (you will see the exact upcharge as you scroll down through the choices). 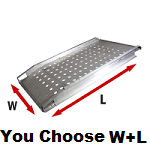 These Made in the USA, lightweight aluminum hand truck ramps come with a 2 year manufacturer warranty. Comes with built in handles for easy handling. Side curbs measure a generous 3" tall to prevent overrun. 1. 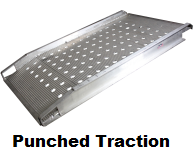 Choose your ramp traction type (choice of twin tooth traction or punched traction) . 2. Choose your end type (choice of hook or apron style). 4. Choose your length (from 6 to 16 feet). you are getting the correct loading ramp for your needs. As with all walk ramps, these are designed only to be used with two wheel hand trucks, they are not intended for wheelchairs, pallet jacks, or powered equipment. Need something different than offered here? Call one of our solution specialists at (888) 811-5941. Please Note: Not all combinations are compatible and you will see references to that effect as you scroll down the page. At the same time the system is set up to disallow a combination of non-compatible parts, so you may shop in confidence! Twin-Tooth grooves ensure better traction in both directions. Lightweight interlocking design, ramps are easily portable. Holes are punched in the material, providing superior traction and reduces the the weight without sacrificing strength. Won’t collect ice, mud, snow, or debris. 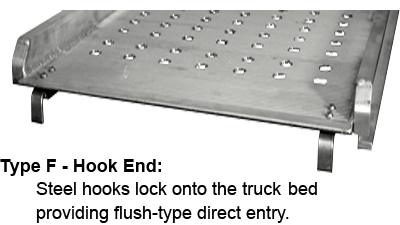 Steel hooks lock onto the truck bed providing flush-type direct entry. 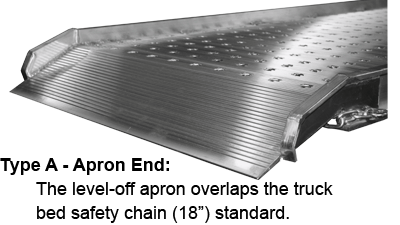 Level-off apron overlaps the truck bed, Includes 18" Safety chains. Plese Note: Image is for illustration only, the finish and end type of your ramps will be according to what you chose in previous steps. *Usable deck size 23 Inches. Not compatible with Apron Style End in previous step. .
*Usable deck size 25 Inches. *Usable deck size 35 Inches.